Stouts tend to have a natural, but passive, chocolaty taste to them due to the roasting of the malts (or the inclusive of the "chocolate malt" grain). So it comes as no surprise that a brewer might also add actual chocolate to the mix to create for an overtly chocolate stout, as is the case of Young’s Double Chocolate Stout. Brewed in England, where stouts and porters have a history of functioning as a working man’s session beer, this particular stout ups the ante a bit with a noticeable milk chocolate flavor in the finish. With the words "double chocolate" in the name you’d think this would be basically an alcoholic candy bar, but it’s actually rather mild. I think that’s due to the fact it’s deliberately pedestrian since it’s so easy to drink, but it’s still quite enjoyable anyway. Poured into a traditional "Victorian" pint glass, this beer looks a lot like the typical stout: an opaque black body with just the slightest bit of ruby red showing around the edges. It forms a fairly thick, light brown, frothy head (which does leave some beautiful lacing on the glass). The aroma is fairly mild, as there isn’t much to detect other than lightly toasted malts and a chocolate candy-like scent. 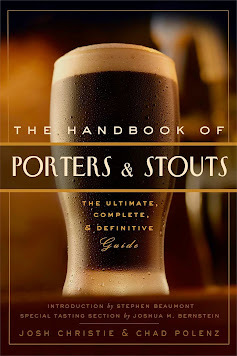 As I said, stouts have traditionally been mild, lighter beers and anyone who has tried a traditional dry stout or even some European sweet stouts would know a beer of this style often starts out rather watery on the palate. That’s certainly true of Young’s Double Chocolate Stout as it’s noticeably watery and mild in the initial mouthfeel. There is a slight almond-like taste and a hint of toasted malts, but otherwise it’s rather quiet on the palate. Young’s begins to make some noise on the back end. As it goes down a fairly rich taste of creamy milk chocolate coats the tongue. It’s sweet but not overly-sweet, as this flavor is closer to semi-sweet chocolate used in candy. It’s not bitter the way baker’s chocolate or dark chocolate would be and doesn’t leave a dry aftertaste, either. In fact, the beer as a whole finishes quite clean (which is a bit of a letdown considering how appealing the chocolate flavor was - I wouldn’t mind if it lingered). One of reasons I have a preference for chocolate beers is the fact they tend to be so rich and tasty they aren’t the kind of beers that can be quaffed down. The opposite is actually true for Young’s Double Chocolate as the light, slightly water body and the mild palate create for a very smooth and clean finish. What surprised me was how the beer also had a bit of a soda-like fizzle on my tongue which I think enhanced the sweetness a bit. At 5.2% ABV this is a medium-bodied beer and actually quite light for a chocolate stout. It doesn’t have the density or the potency of other gourmet-level dessert beers and might be the only chocolate stout that could truly be called sessionable. Now that Young’s Double Chocolate Stout is available in a four-pack of 12oz bottles I think this beer might go mainstream. The $9.99 price might turn off some consumers, but it’s definitely a better value than the 500ml bottle at $6.99. Joe and Jane Six Pack will be amazed at the drinkability and most likely enjoy the genuine chocolate flavor (if they can get past the notion that stouts are "thick" and "heavy"). Chocolate stout lovers like me might prefer something more intense, but this will definitely do! With the holidays coming up I thought I’d give Young’s Double Chocolate Stout a try since it combines chocolate and beer, at least technically. I was hoping for a sweet, creamy beer, but what I got was basically a neutral-tasting beer with a chocolate aftertaste. It poured almost exactly like Guinness where the entire glass was bubbles that crash down upon each other until reaching about 1 inch from the top at which point they know when to stop. The head is thick, light brown and creamy and absolutely never dissipates while leaving constant lacing on the glass. In fact, the head is tastier than the body and possibly the best feature to this beer. Young’s is extremely dark brown in color, or essentially opaque black. There isn’t much aroma to speak of, just that of a standard stout with the slightest hint of chocolate. I noticed as the beer reached the bottom of the glass the chocolate scent became more pronounced. I wasn’t sure what to expect from Young’s Double Chocolate Stout – would it be an alcoholic chocolate milkshake or just chocolate-flavored beer? Well, neither of these would accurately describe this brew as it tastes like a generic stout with a mostly bitter palate that happens to have a chocolate aftertaste. I found the taste to be rather plain and quite dry. The chocolate flavor is extremely dark and chalky. I was hoping for a liquid candy bar but that’s just not the case. Overall, the taste is almost watery in a way. It’s not off-putting in the least, but just not nearly as tasty as I’d hoped. I may not be a stout expert but one thing I do know is these beers are known for their smooth finish and easy drinkability. Even the taste here is a bit dry, but it’s still no challenge to drink whatsoever. Having such an extremely creamy head certainly doesn’t hurt, either. Stouts are (often mistakably) thought of as being thick, heavy beers and since this beer contains a sugary flavor on top of the usual beer ingredients it should be nearly obese, right? Surprisingly, Young’s Double Chocolate Stout is much lighter than you would assume. At only 5.2% ABV, this is quite an average-strength beer. The body seems thinner than most stouts, although I’d imagine each serving contains at least 200 calories (information not available on the brewer’s website). You could easily go through a few cans of it without feeling overwhelmed. From what I can tell I’m in the minority for not loving Young’s Double Chocolate Stout. Not that I think it’s a bad beer, but I just didn’t find it as appealing as most other drinkers do. I was hoping for a richer, sweeter taste, but what I got was drinkable and satisfying.